February 3, 2017, 1:11 PM · Happy birthday, yesterday (Feb. 2), to both Jascha Heifetz<?a> and Fritz Kreisler, who would have been 116 and 142, respectively. You've been granted a wonderful opportunity, but a difficult choice: You can travel back in time to see a live performance by either Jascha Heifetz or by Fritz Kreisler -- both only one! Which would you choose? 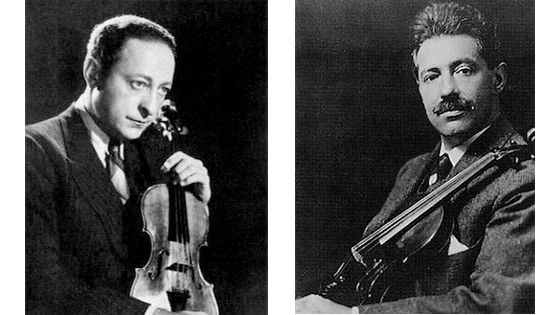 Jascha Heifetz, left, and Fritz Kreisler. And if you really know your history, what specific performance would you choose? And then, what would you regret missing from the other violinist? Please vote, and share your thoughts in the comments section. Also, feel free to link to Youtube performances you particularly like of either violinist. February 3, 2017 at 09:11 PM · Jascha Heifetz by all means. Scottish Fantasy by M. Bruch. February 3, 2017 at 10:29 PM · It would be the Heifetz debut at Carnegie Hall..
February 3, 2017 at 10:49 PM · Since I grew up watching the Great Heifetz on the Bell Telephone Hour, I would have liked to have seen Fritz Kreisler in a live performance. I have a recording that was issued on his 75th birthday and some remastered CDs. Mr. Kreisler had a much different style so that is why I voted the way I did. February 3, 2017 at 11:04 PM · This is a difficult decision, however my choice is Fritz Kreisler, since that style of artistry no longer is touring. Of course, the Heifetz virtuosity no longer is touring, either. February 3, 2017 at 11:09 PM · Kreisler, playing Schubert D 574, Beethoven op. 30/3 and Grieg op. 45 with Rachmaninoff at the piano. Not hard to find video of Heifetz in good form. Not sure I have ever seen a clip showing Kreisler playing, and it wouldn't be of him in his prime. February 3, 2017 at 11:12 PM · Bill makes a good point that we have video of Heifetz. But if you say you'd rather see anyone but Heifetz, you're automatically a waste of perfectly good Carpathian maple. February 3, 2017 at 11:21 PM · Have seen each in-person...a case favoring one over the other is difficult to build....Heifetz stoic, removed, impersonal, fidgety and spectacular....Kreisler smiling, at ease, congenial, warm seemingly approachable...and spectacular. Different literature, different goals, Heifetz all fingers, bow and subtle, Kreisler all tone and blatant musicianship. Despite what seems to be the American Way of labeling the best, fastest, biggest, etc, it IS possible to enjoy and retain more than one champion be it music, sports, food, literature. This is something all should learn at an early age. February 3, 2017 at 11:34 PM · Kreisler, but mostly because there are so many more videos of Heifetz available. If there were no videos available of either of them, I would have to say Heifetz - doesn't matter to me what piece. February 3, 2017 at 11:57 PM · Kreisler, because I've seen Heifetz. February 4, 2017 at 12:16 AM · Heifetz Always. February 4, 2017 at 01:32 AM · Kreisler, as I have actually seen Heifetz when I was a child. February 4, 2017 at 01:52 AM · Kreisler, because of his musicianship, but Heifetz's musicianship comes out in his later chamber music recordings (I wasn't impressed with the Beethoven Op 12 No 2 that I heard in my university days - It wasn't with Oberin). February 4, 2017 at 02:27 AM · Kreisler, because he's the only one of the two who might invite me out afterwards for a drink or some friendly interaction. February 4, 2017 at 03:45 AM · I'm with everyone else here Heifetz no contest! Kreisler wrote some wonderful music but Heifetz was the Paganini of our time. I like Kreisler as a violinist too but there were many better ones like Oistrak, Perlman, Menuhin, Rosand, Milstein, Rabin. Rabin to me was 2nd place after Heifetz. February 4, 2017 at 03:46 AM · Heifetz no contest! February 4, 2017 at 03:59 AM · What's all this about Kreisler's "musicianship"? Didn't Heifetz have any? February 4, 2017 at 04:47 AM · I would rather see Heifitz, but would miss the romantisism of Kreisler's playing. February 4, 2017 at 05:06 AM · Can't I go back in time and request that they perform the Bach Double together? February 4, 2017 at 05:36 AM · A very difficult question... Shen, above has probably the best idea; Bach Double together!!!!! February 4, 2017 at 05:48 AM · If I can't commandeer this wonderful time machine to the period of Joachim or Paganini, then...Carnegie Hall, 2:30 PM, Sunday, December 9, 1951. Guest conductor George Szell directs the New York Philharmonic in a public performance of Brahms' Violin Concerto in D major, featuring Jascha Heifetz. I'm ready. February 4, 2017 at 06:22 AM · 12 year old Heifetz, when he played the Mendelssohn for Kreisler who accompanied him at the piano. This is a hard choice, as I admire both players (who happened to admire each other, too), but I would love to experience Heifetz and his unique sound live. February 4, 2017 at 07:12 AM · Now that is a cool thing to know! February 4, 2017 at 07:39 AM · Heifetz. February 4, 2017 at 07:40 AM · Depends on whose judgment you trust. You could take Kreisler's choice and see Heifetz. Or Heifetz's choice, and see Kreisler. February 4, 2017 at 02:59 PM · I was fortunate enough to see Heifetz also - once, in the late 50's in a recital in Orchestra Hall in Chicago. He was terrific. Unfortunately, I've long since lost my copy of the program. But I do recall the performance of the Franck Sonata, which was spectacular. And, yes, he had that classic Heifetz stage demeanor, which I happen to appreciate. Nope, never saw Kreisler. But I did see Michael Rabin, Leonid Kogan, David Oistrakh, Nathan Milstein, Yehudi Menuhin, Zino Francescatti (my personal favorite), and Isaac Stern (Stern when I was very, very young, in the mid 1940's). February 4, 2017 at 04:10 PM · Kreisler, because I heard Heifetz in London (Mozart K 219, and Sibelius concerto). And I'd LOVE to hear Kreisler playing his own compositions -- around 1910 when he was at his peak. February 4, 2017 at 06:00 PM · I'm curious to learn exactly what it was about Kreisler's playing that has been lost. February 4, 2017 at 06:12 PM · I've heard Heifetz live, but not Kreisler. As the first private protege of Nathan Milstein in his London home for over 3 & 1/2 years, following my Jascha Heifetz Violin Master Class studies (Ref. ~ YouTube, Jascha Heifetz Violin Master Classes, USC - Khachaturian, JH-7, Elisabeth Matesky), I can tell you that in my last visit with Mr. Milstein in London at his Chester Square home, during our to be final High Tea chat together with Mrs. Therese Milstein, on July 15, 1992, (Ref. The Strad, a Winter issue, 1993, w/ photograph of Mr. Milstein & myself, taken by Mrs.Therese Milstein during our last High Tea Chat in their Chester Square London, SW1 home), Mr. Milstein lamented the loss of his deeply revered colleague and close friend, Fritz Kreisler, due, in part, to the passing of 'Viennese folklore' which, to my ears & knowledge, no longer exist's. If you listen to Mr. Kreisler's playing of his own 'Liebeslied' on a YouTube CD recording, you will realise how precious was Fritz Kreisler's style & unique personal approach which has never yet been replicated. It is a question of God given love, charm & environment, unadorned ~ Hoping this helps as it is probably about as close an answer you can receive ... *Mr. Heifetz also loved Fritz Kreisler's playing for similar reasons & was deeply grieved upon the NYC passing of his beloved friend, on January 31, 1962, and expressed his feelings to me on that poignant day in unusual circumstances. If you wish more dialogue, please go to www.linkedin.com to my Profile & contact info, okay!! February 4, 2017 at 08:35 PM · I was fortunate enough as a young student to attend a Kreisler recital in Pittsburgh in about 1939 or 1940. I never heard Heifitz in person. So I guess I would vote to hear him now. Hearing either would be wonderful. Kreisler was a very warm person in addition to being a great artist. Audiences loved him as well as his music. February 4, 2017 at 10:42 PM · Kreisler. Because there are more videos of Heifetz. February 4, 2017 at 10:43 PM · Because of when they did most of their recordings, I believe that the recorded sound of Heifetz better represented him than was the case with Kreisler. So for that reason I'd choose to Kreisler in person on his best night - whenever that was. I never did like either/or choices! Once somebody asked me who I thought was the greatest Opera composer, Wagner or Verdi? I said MOZART! February 4, 2017 at 11:15 PM · One thing to consider: while Kreisler has gained the reputation of a purveyor of lollipops, he did a lot of very serious recital work. Bach, Brahms, Ysaye, and a lot of other things we don't always associate with him. So there is a lot of his career that we really can't recapture on recordings. February 5, 2017 at 12:09 AM · Yes, as I'm typing this I'm listening to Kreisler play the Brahms concerto on the violin channel. February 5, 2017 at 12:48 AM · Kreisler at the height of his art, playing one of his own arrangements such as his version of Paganini's I Palpiti. I love Heifetz, but there is way less footage of Kreisler in comparison, and he was an unique and incredible artist all of his own. Maybe it wouldn't be an exaggeration to express that "every" violinist owes both Maestros for what violin playing is today. February 5, 2017 at 12:57 AM · Well, speaking as someone who has, admittedly, never shared High Tea with Mrs. Milstein in Chester Square, I guess I was hoping that Kreisler's inimitable charm originated in something less enigmatic than "Viennese folklore." February 5, 2017 at 10:19 PM · Have seen Heifetz live, I'd enjoy seeing Kreisler in a heartbeat if given the choice. February 6, 2017 at 02:41 AM · I have a question for Ms. Matevsky, but don't know if she'll she this. Would you please share some of Mr. Heifetz' insight on vibrato? I know he didn't care how it was produced, but it seem rather difficult to emulate his vibrato. When I hear it, it sounds like a mixture of constant finger tapping (on-off string) mixed with arm or wrist motion. Did he have any exercises for improving vibrato (although he only taught more advanced students)? February 6, 2017 at 05:39 PM · As a student of one of the original seven Heifetz USC students, I have thorough familiarity with the Heifetz artistry and techniques. I wish I could have studied under Maestro Kreisler and learned to produce his distinctive magical tone and phrasing, and composition, too, which even Heifetz adored. Heifetz is relatively well documented. I wish that through this time fantasy Maestro Kreisler could be brought up to par. I would love to see him, in person, transmit his inimitable artistry and warmth into the beloved Liebesleid. February 6, 2017 at 06:03 PM · Neither! I would fiddle with the controls of the machine (and probably get stranded) and watch Paganini play his 24 Caprices at the height of his powers. February 7, 2017 at 03:10 PM · Kreisler, for the showmanship and musicality! February 7, 2017 at 06:49 PM · I think it was Perlman that said the sound of Heifetz gets lost on the recordings, and no recording is comparable to the live performance of Heifetz. I know what he means after attending a performance of the Beethoven Concerto by Augustin Hadelich. I would love to hear the same live performance by Heifetz.